The Shadow's Mantle Set Dungeon is located in Act V, Pandemonium Fortress Level 3. You will need to teleport to Pandemonium Fortress Level 2, go through the chain of teleports and platforms leading up to the lower level, and enter it. At the very start of this short ledge leading to Malthael, the Shadow Set Dungeon should spawn if you have the 6-piece bonus active. The Shadow's Mantle Set Dungeon's two unique Primary Objectives are to: 1) Chain consecutive bonus damage Impale hits on 20 different enemies 5 times; and 2) Slow 45 different enemies with your Shadow Power. 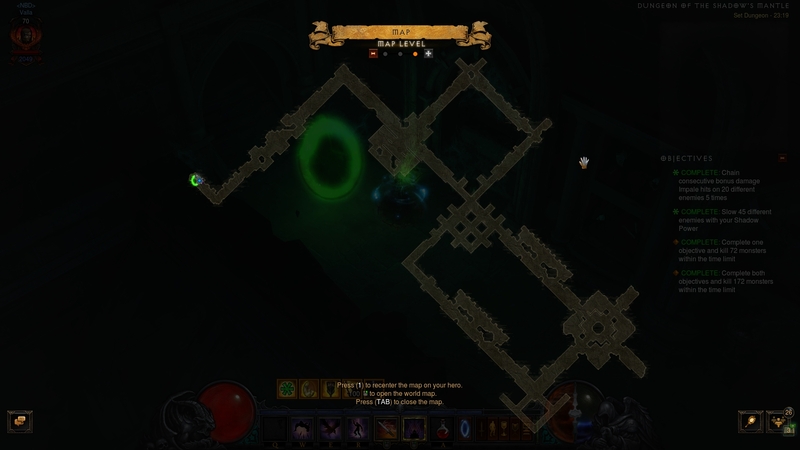 The Shadow's Mantle Set Dungeon is a crypt tileset of lengthy corridors. It basically consists of an entry corridor, followed by two interconnected shapes — a square and a rectangle. The order in which you clear them should not matter, though we generally advise you go through the (lengthier and harder) rectangle path first. Skeletal Raiders, Skeletal Sentries, Tomb Guardians and Returned — numerous, slow moving and harmless trash. They will be the primary targets for both unique Objectives of this dungeon. Hulking Phasebeast — be careful of the Phasebeast's short and sudden teleports, as they might break your Impale chains. Try to get them point blank as they try to melee you. Shadow Servants — the unique enemies of the map. They resemble Act 4's Terror Demons, but also have the Arcane and Wormhole affixes. Be careful of their displacement mechanics, which can cause a break in the Impale chain. As with most Set Dungeons, a follower is not necessary and might get in the way more than help the situation. Do not be afraid to dismiss your companion. The most important tip for this Set Dungeon is not to go trigger happy and take your time lining up the shots. Liberal use of point blank shots is also encouraged, as they minimize potential mishaps and will double up for a Shadow Power activation for the other objective. Beware of the various rubble and walls of the crypt tileset, as are deceptively low but will still cause your Impale knives to collide and fail the chain. Try to get the Shadow Power objective out of the way early — a third of the way into the dungeon and you should be done with it — as it can easily be lost track of. Remember that while the passive bonuses of the skill will be permanent with a single use due to the set bonuses, the slowing effect only occurs on activation. Make sure to re-apply it in the thick of enemies to get the Night Bane slow kicking in. With all the careful sniping you have to do in this dungeon, you will have to forego many Impale build staples — especially Holy Point Shot, whose shotgun spread will automatically fail each attempt to start the chain. Other less obvious exclusions are the popular Ricochet and Overpenetration runes on Impale, as well as skills like Vengeance and Fan of Knives. On the flip side, some enemies will help out the sniping objective — the shielded skeletons will net you two Impale hits.